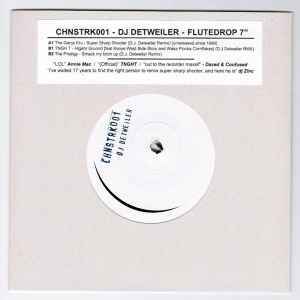 DJ Detweiler* ‎– Flutedrop 7"
Vinyl funded by internet fans of Dj Detweiler. Sold out before release. I have #11 of 100.......keeping that 'ish 4 LYFE!! It's never even touched a stylus. Maybe 20 years from now, I'll finally play it.....bring some joy back into an old man's life. I am sad I missed ht eboat on this one because it is the best songs to drop but i illegally downloaded them from my friend internet website. But it's ok because i buy all the mixtapes on Chinstroke Records that aren't this to be happier. Slamma Jamma 7"s of pure flute mayhem sure to float any parties boat. Simply sublime. My most treasured record. I payed €6.2 million for it but I would have paid twice as much. I'm proud to own this vinyl. It's the biggest DnB media scoop since the DnB Illuminati, and Detweiler is obviously a post culture genius. Urrrrgh didn't even know he was running a crowdfund for this.